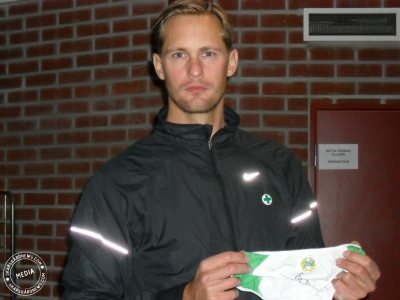 The last three Alexander Skarsgård autographed Hammarby IF woman’s size L thong underwear for auction for Bajen Aid. These make fantastic holiday gifts for any Alexander Skarsgård or True Blood fan! There are only 3 of these left and they are all for sale right here — the Hammarby shops are completely out of stock. What is Hammarby IF? Hammarby (Bajen) is is Alex’s favorite soccer team in Stockholm, Sweden. These thongs were signed by Alex in person at the beginning of October 2010 in Stockholm, Sweden at the Bajen Aid auction there. See the photos of Alex signing the thongs and holding one up. I’m just wondering why they would need our money? What does it go to? It’s pretty vague to just say that it’s to a soccer team. The ebay auction didn’t say anything more though.. The money is for Hammarby, Alex’s favorite team. Please ask your questions to skarsgardnews.com who have organized this auction, they can give you all the info.